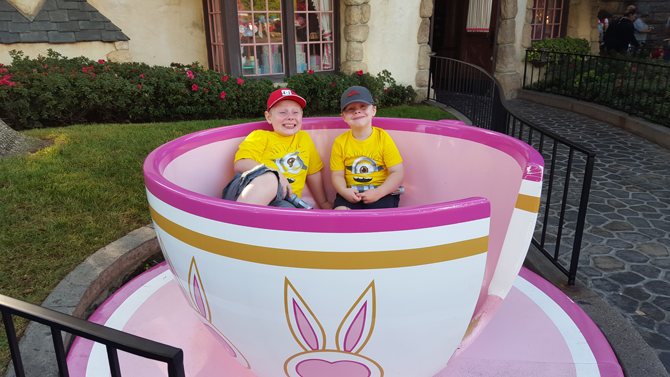 As a Disneyland enthusiast and and mom on a budget, in order for my family of 4 to be able to travel to Disneyland, I have to budget, and I stick to it! … We travel from a suburbs of Vancouver, Canada so we also have to account for the dollar exchange, making doing Disneyland on a budget even more important! … After a few trips in recent years, I have learned where to save money without compromising the magic of the Happiest Place on Earth! 1. Fly out of a smaller airport on a budget airline! We travel from BLI (Bellingham) instead of YVR (Vancouver). It’s just a short drive across the border (actually closer than our local airport if you don’t account for border delays) and even with the dollar exchange parking is cheaper. Keep and eye on flight packages they often go on sale for less then a USD 98.00 each way if you can travel on non peak days. As a bonus, we enjoy the smaller airport feel and the ease of watching our children, as it’s not as busy nor is it a 10 minute walk to your gate! Check out our posts on Google Flights to get the best flight deals from your city! 2. Book a hotel with a continental breakfast and utilize it! Most will serve very basic food (no hot meals here) but if your family is happy with yogurt, cereal, fruit, donuts and coffee or juice, this will save you from having to purchase breakfast or eating breakfast at a restaurant! … We also grabbed a couple apples and yogurts each morning and put them in the fridge provided for us in our room for a healthy snack later! Read some of our Family Hotel Musts and check out Hotels.com for the best rates and an awesome loyalty program! You Can also check out Booking.com for great hotel rates! We will have a whole post on our favorite hotel hacks coming soon! 3. Purchase some souvenirs BEFORE you leave (but not all, because where is the magic in that!) We like to buy Disney themed shirts for the kids from www.disneystore.com when they are on sale for 2 for $20. They are often the same as the ones you will see in the park at a fraction of the cost! You can also find tees and other Disney themed clothes at local department stores like Walmart or on Amazon.com or Amazon.ca (if you are shopping from Canada like us!). If your little princess is going to want to visit the Bippidy Bobbitty boutique either bring a dress from home that you already own, or purchase a princess dress before you go. If you child is going to collect character autographs or trade pins autograph books and lanyards these are cheaper on Amazon. You can purchase pins cheaper on www.ebay.com but beware of fake pins! Disneyland cast members will only trade Disney certified pins and there are lots of fakes out there. Bonus tip: Bring a sharpie for autographs, they are easier for characters that wear gloves as part of their costume to hold. Hit up the dollar stores or amazon.com or amazon.ca for Glow Sticks, water misters and other misc Disney paraphernalia. Your child will want Glow Sticks during the fireworks and it will be easier to say no to the pricey Disneyland ones, if you have some in your bag ready to hand out! 4. When you enter the park head to town hall and purchase a gift card for each child with a budgeted amount per child for souvenirs! My children had $100USD that they had saved themselves, from birthdays leading up to our trip. We told them that once this was gone that they would not get any more money for souvenirs. This gave them a sense of responsibility and allowed them to choose their own souvenirs. Compared to an earlier trip where we did not do this they were much more careful about what they chose! We also didn’t intentionally go into any of the stores lining mainstreet. We only visited stores when you had to exit a ride and walk through the store to get back to the walkway. 5. Hit up the local Target! Depending on your hotel Target is only a 5 minute cab ride/car ride away! Stock up on favorite snacks, lots of water, and even lunch food! Disneyland allows you to bring in a soft sided cooler (but be prepared for all your bags to be searched before you enter the parks). We packed frozen water bottles to act as ice packs for other water and food and then made a nice refreshing drink later in the day once they’ve melted! We’ve always kept our cooler in the bottom of our stroller but if your kids are older you can pack lunch and water in each individuals backpack or rent a locker at the front of the park! If it’s hot make sure to pack lots of water! Bonus time saving tip! Eat lunch while in a longer line up instead of finding a spot to sit and eat! It will keep the kids busy and you won’t be wasting time eating and then waiting in line! 6. Deep discounts are hard to find for Disney passes but you can find tickets such as CityPASS or other retailers who will save you some money. We follow Mouse Savers for great tips! You can also check with your credit card companies and rewards points to see if they offer Disneyland passes. 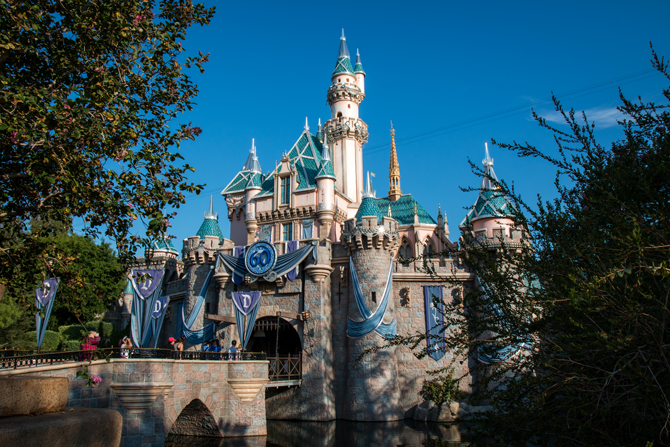 You can see how we got a free 3 Day Park Hopper Disneyland Pass here! Bonus tip: if you purchase a multi day pass and decide after you’ve purchased it that you would like to visit the park for an extra day or 2 you can upgrade your pass at will call! For example if you originally purchased 3 day passes for you family and then decide you actually want to visit the parks for 5 days, take your original passes to will call and you can upgrade to 5 day passes for the difference in price of the 3 day pass vs 5 day pass. This is far less expensive then purchasing 2 day passes. 7. Rent a compact car for the week. We paid $79 for the week to rent a compact car at the airport. It was less expensive then taking the shuttle to and from the airport. It also allowed us to hit up Target several times without taking a cab. Bring your own car seats or booster seats though as rental places often don’t check expiry dates and often charge a rental fee. (you can read more on why we Travel with Car Seats from one of our earlier psots) Also bring your own GPS or confirm that it is included in your rental car. 8. Skip the photo pass option! Bring a small camera or your cell phone and ask the photographers to take a photo with your camera! Cast members are super accommodating! Just make sure that you have the zoom set where you want it and all settings set correctly as they won’t adjust anything, they will only point and shoot! If you are going to use the Photo Pass option pre-purchase your package before your trip to save some money. 9. Bring you own stroller if you need one! Disney strollers are expensive to rent and you cannot take them out of the Parks, so at the end of the night you will have a tired child who you will most likely need to be carried back to the hotel or to the shuttle. If you absolutely cannot bring your own stroller, rent from a stroller rental company, you can read our City Strollers Review You can rent a high end stroller (or double stroller) for less than the strollers at Disneyland and they deliver to your hotel before your arrival, and pick it up at the end of your trip! Bonus Tip: Your stroller may be moved when you park it to go on an attraction, don’t panic. If you can’t find your stroller find a cast member! If you can, attach something visible to set your stroller apart from the other strollers to make it easier to spot if it does get moved! 10. If you don’t mind taking a shuttle to and from the park, book a hotel further away from the park! They are less expensive than hotels within walking distance! When booking a hotel, keep in mind how much time you will be spending in the room and decide if you want to spend more or less on your accommodations! We usually book a budget hotel because we spend as much time as possible at the park. Visiting WDW for the first time? 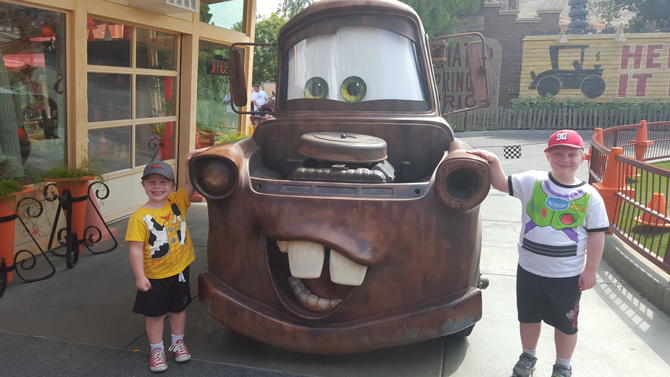 Check out this post on Disneyworld for First Timers! Did I miss any budget friendly ideas? I’d love to hear your favorite money saving Disney tip! Let me know in the comments! 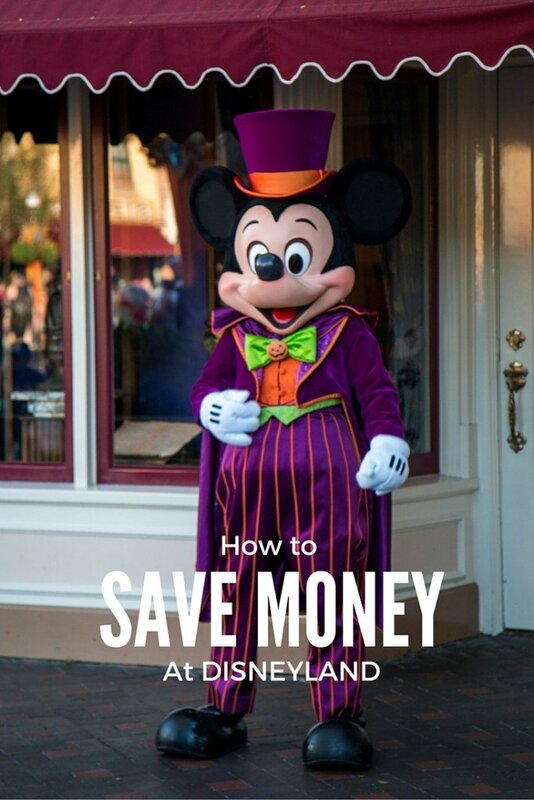 If you found this page on how to save money at Disneyland helpful, i would love it if you would pin, share or tweet it on whatever social media platforms you use! Every little bit will help us fund our travels and continue to bring great content to our site! 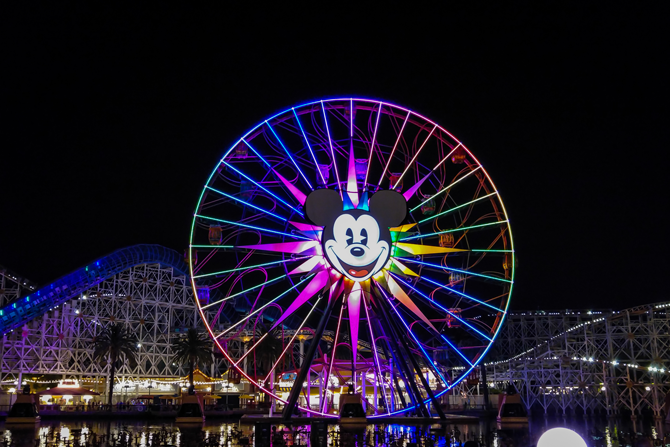 You can hover over this pinnable image (or any image on my site) on how to Save money at Disneyland to quickly pin it… ! Editor”™s Disclosure: this post contains affiliate links. If you click on a link and make a purchase, we receive a small commission at no extra cost to you. 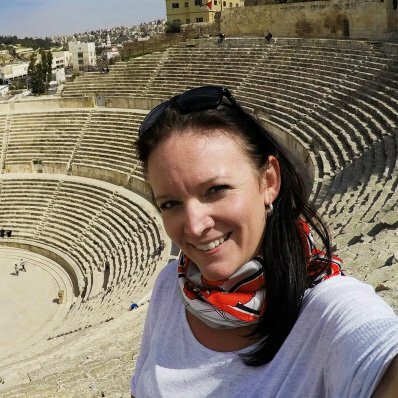 Thank you for helping cover the costs of running this website and enabling us to share our travel inspiration with others! Photo Credits: Halloween Mickey,… Disney Castle, Disney Wheel, by… Harsh Light… used under C.C. Wife, Mom to two boys, loves crocheting, everything Disney, Essential Oils, and exploring new places with her family. These tips are great! It’s amazing where you can cut costs when you put a little effort in! The Mickey Ferris Wheel is one of my favorites and I can never get enough of Cars while at Disneyland. Great travel tips and those smaller airports are often a money saver, as the parking is often free or as low as $6 a day. Did you know that Disneyland will give you a FREE cup of cold water. All you have to do is stand in line and ask. You do not need to carry around an ice chest full of cold water. That can get heavy! One think i want to Know that ,can we use coupons codes at Disney land?? I have never come across any Farrah, but there are often deals for locals, as well as International visitors.